FLAT SHIPPING CHARGE NO ADDITIONAL SHIPPING COSTS REGARDLESS OF ORDER SIZE AND WEIGHT Prevent Foreign Object Debris This towed sweeper features a super strength magnet ideal for sweeping roads, parking lots, driveways, airport runways, ramps, etc. * Meets USA Government military specifications under MIL-S-29174B. * 2" clearance at 13 mph with magnets in sweeping position, 5" clearance with magnets in traveling position. 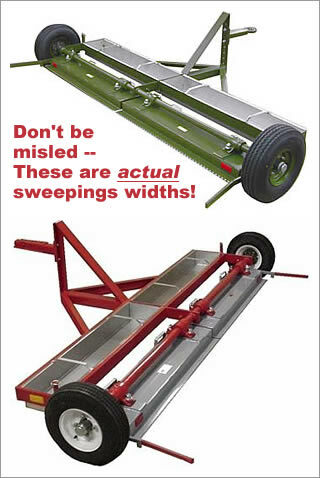 * Actual sweeping widths of 60", 72", 84" and 96" * Attracted material is easily dumped into 4-1/2" deep retainer pans eliminating time-consuming trips to dump sites. * Trailer-type frame constructed of heavy gauge steel members for long-lasting performance and durability. * Equipped with 19" pneumatic tires, safety reflectors, safety chain, and your choice of coupling attachments. * Replacement parts available. * Available in Red or Green * Unconditional Product Performance Guarantee For more info please visit http://www.fly-supply.com/vmchk/Magnetic-Sweepers/View-all-products.html.